One of the signature desserts of Australia, the Lamington is a simple sweet with origins as fuzzy as it looks. If you can believe any account (and there are many), the quaint little cubes of cake dipped in chocolate then rolled in coconut were named for Lord Lamington, the governor of Queensland in the late 1800s. If you can further believe a particular account, Lord Lamington was said to have despised and dismissed his namesakes as "those bloody poofy woolly biscuits." I say to heck with the old coot, and calls 'em as I sees 'em: Bedlingtons. Preheat oven to 350 degrees F. Grease two 8-inch square cake pans. In a large bowl, whisk all dry ingredients together. In another, smaller bowl, beat the egg whites with the 1/3 cup sugar until thick, but not stiff. Add milk, egg yolks, oil and extract to the dry ingredients, beating for 3 minutes. Gently fold or stir in the egg whites. Divide batter evenly between the cake pans. Bake for approximately 25 minutes or until a skewer inserted in center of the cakes is clean when removed. Cool cakes 10 minutes in pans before removing to rack to fully cool. To minimize crumbing and breakage, it is important that the cakes are firm and set before cutting into 2-inch cubes. Chilling the cake before cutting also helps. Allow cubes to sit out several hours to become just a little stale before you dip them in the chocolate. This will correct once the frosting sets. With a whisk, beat all ingredients in a large bowl until very smooth and loose. This post is for Suganya of Tasty Palettes, hosting Coconut, the June theme for A Fruit a Month (AFAM), created by Maheswari of Beyond the Usual. Slice off gnarled and leafy ends of celeriac and discard. Peel celeriac, then cut into matchsticks. Add to aciduated water to prevent browning. Peel and core apple, then cut into dice, adding it to the water with the celeriac. Set aside. In a medium bowl whisk all ingredients together. Adjust vinegar, celery salt and/or pepper if necessary to your preferences. This post is being submitted to Joanna of Joanna's Food, hosting Weekend Herb Blogging for Kalyn Denny of Kalyn's Kitchen, the creator of this ever-popular weekly food-blogging event. Do you wig at the very idea of baking? Do the precise measuring of ingredients, setting oven temperatures, and fretting over "doneness" have you lingering at the cardboard boxes of store-bought baked goods just a little too lovingly? For all of us who can fiddle a twist of pastry lattice over the plumped, fruited curves of a pie filling, there are just as many who find the reading of a recipe a certifiable ordeal. Well, maybe I can help with a great find of a baking cookbook. As some of you are likely aware by now, the food-blogging community is rallying together for Bri Brownlow of Figs with Bri, a cancer survivor who has recently been beset by further serious complications to her health. As part of their fundraising effort to help Bri with mounting medical bills, Jugalbandi has organized an assortment of beautiful raffle prizes collected from several bloggers. 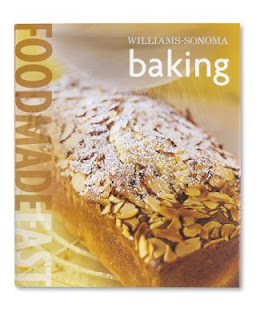 My donation is Food Made Easy - Williams-Sonoma Baking*, one of a series of cookbooks from the well-known California cooking and entertaining retailer. I have prepared adaptations of two Williams-Sonoma recipes for this blog, Mini Almond Cherry Tarts, and Cannellini, Fennel and Olives. Both were easy to follow and great successes. Should you be the winner of this smart-looking and practical hardcover volume, I think it will find a permanent spot among your other cookbooks, no matter what your level of baking expertise. You can make a donation to bid on this prize here. As noted in my last post on Bri, there are other ways of helping and publicizing the cause, including a Special Addition of CLICK, the monthly Jugalbandi culinary photo event. 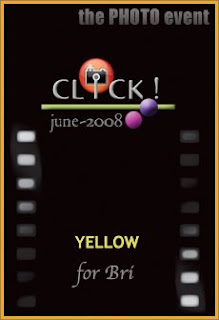 June's theme features yellow, the happy hue. My lemon fudge, from a recent post, is as vibrantly flavored as it is colored. It is my entry for CLICK. Thanks always for your generosity and consideration! * I have no personal nor business relationship with Williams-Sonoma nor their publisher, Oxmoor House. Flapjacks, crêpes, pajeon, dosa, blini, tortillas, crespelle, jian bing, pikelets, ataif, blintzes, bánh cuốn, palačinka, injera …the varieties are as endless as the cooks who prepare them and the countries they hail from. Those delectable disks of batter or dough, browning, bubbling and blistering on hot metal surfaces are as much the staff of life as bread, and often quicker to prepare than that adorable glazed cinnamon bun you are just about to reach for now. Not only a cherished breakfast staple, pancakes are one of the meals to beat when you want to satisfy your carb cravings and nutritional needs in the same bite. Want to take a peek at how your neighbors across the hall or across the oceans prepare their pancakes? 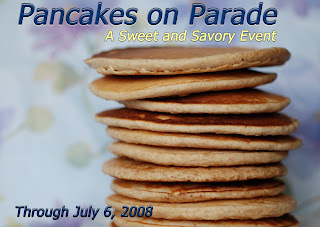 Between now and July 6, I am hosting Pancakes on Parade, an event to showcase the fascinating and flavorful things we magicians can conjure with some starch, liquid and heat. Recipes submitted can be as simple or elaborate as you choose, as sweet as the syrup you pour on them or as savory as salsa. All cultures and courses are welcome. Use of the logo is also optional. I will post the round-up some time during the week of July 6 . I will also be giving away a copy of Pancakes A to Z by Marie Simmons*, a fun companion cookbook to supplement the collection of fine recipes I am looking forward to receiving from you. The prize will be awarded through a random drawing of all submissions, to be shipped worldwide to the winner at my expense. Those who aren’t bloggers are also welcome to submit recipes and photos which will be included in the round-up and drawing. So, get those bowls, whisks and fires going! We’ll open a virtual International House of …er…you know what! Thanks for joining in! * I do not have any personal nor business affiliation with Marie Simmons nor her publisher, Houghton Mifflin. Family and friends are not eligible for the prize. deluxe chocolate custards are dense and dangerous. In a small saucepan gently warm the whipping cream before it reaches a simmer. Remove from heat and add the lavender blossoms. Set aside until lukewarm then strain out the blossoms and discard them. Return cream to the saucepan, cover it, then put it in the refrigerator to chill and set the flavor. Return the saucepan to the stove and gently warm the cream over low heat. Add the chocolate, stirring occasionally to ensure it is evenly melted in the cream mixture. Turn off heat. In a large bowl, beat the egg yolks with the sugar until thick and lemon colored. Slowly and incrementally add the warm cream/chocolate mixture to the egg mixture, beating consistently until very well blended. It is critical that you work slowly to prevent the eggs curdling from too much heat applied too soon. Arrange a thin tea towel in the bottom of a large roasting pan. Position ramekins evenly on the tea towel, allowing some distance between each, as well as the sides of the pan. Pour equal amounts of custard mixture into each ramekin. (Oven-safe glass custard cups can also be used). Carefully position roasting pan on the middle oven rack, then add water into the pan until it reaches a depth of halfway up the sides of the ramekins. This ensures the eggs will not be exposed to high heat that encourages curdling. Bake for approximately 35 minutes, depending on size of ramekin. I used very small 1/3 cup capacity ramekins that were ready in 30 minutes. Regardless of size, the custards will be done when a slight shake gently wobbles the surface without splashing it. Remove from oven and roasting pan, allowing to cool for 20 minutes before fully chilling in the refrigerator. If you test the mixture by dipping a spoon into it upon removal from oven, it will appear soupy in texture. Do not worry. The chilling will set and firm the crème to perfect consistency, an intensely thick and creamy center topped by a flexible crust. Best when chilled several hours. This post is being submitted to Maninas of Food Matters, hosting Weekend Herb Blogging for Kalyn Denny of Kalyn's Kitchen, creator of this wildly popular weekly event. Word is out now, moving as fast and blazing as only the brush fire of the internet can make possible, about the plight of one among us, Briana Brownlow, of Figs With Bri. Bri has been revisited with cancer, this time even more seriously. The folks at Jugalbandi, among other bloggers, have spearheaded a campaign to raise awareness and funds to support Bri during her latest rounds of treatment. I have been blogging for over a year. I do not know Bri; we are not personal friends; and I have never visited her blog before. It does not matter. I know who she is now. That is enough.